The man, as a human being, anything new or do not understand something your brain searches to help you recognize it as something known way to avoid fear. Comforted, always, that new and unknown things are less so, so when we eat something we do not know to describe its flavor, always tastes like chicken. Also, as we all have done, we have looked for familiar things in the clouds. To feel better. That child’s play has its because (as I said before) but, unfortunately, the psychological term as unknown. 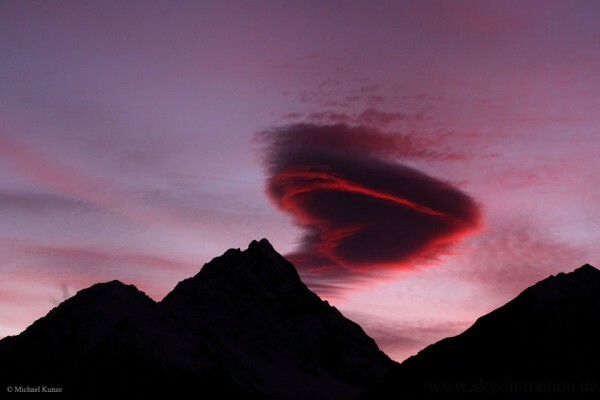 So nothing better for a day like today, a lenticular cloud shaped heart. That if, as always spoiling these things the way that cloud is because winds ascending the mountain, next to the mountain itself whether that water in the atmosphere, combined with the time this picture was taken in New Zealand. Come on, it’s not magic, it’s physics and a great chance. But that physics will remove the illusion.